The installation requires 3 screws and 3 wires. skyBeacon features a UAT (978MHz) transmitter and specially designed blade antenna. The design minimizes installation error and antenna placement issues. A built-in WAAS GPS provides skyBeacon with rule compliant position data for ADS-B transmission. No additional wiring or external GPS antenna mounting is required. The integrated altitude encoder does not require connection to the aircraft static pressure system. Instead, skyBeacon benefits from being mounted in an ideal altitude sensing location, and contains Continuous Calibration™ technology. This patent pending technology automatically and continuously calibrates the integrated altitude encoder for correspondence with the aircraft transponder’s altitude encoder, allowing compliant operations in remote and challenging environments. 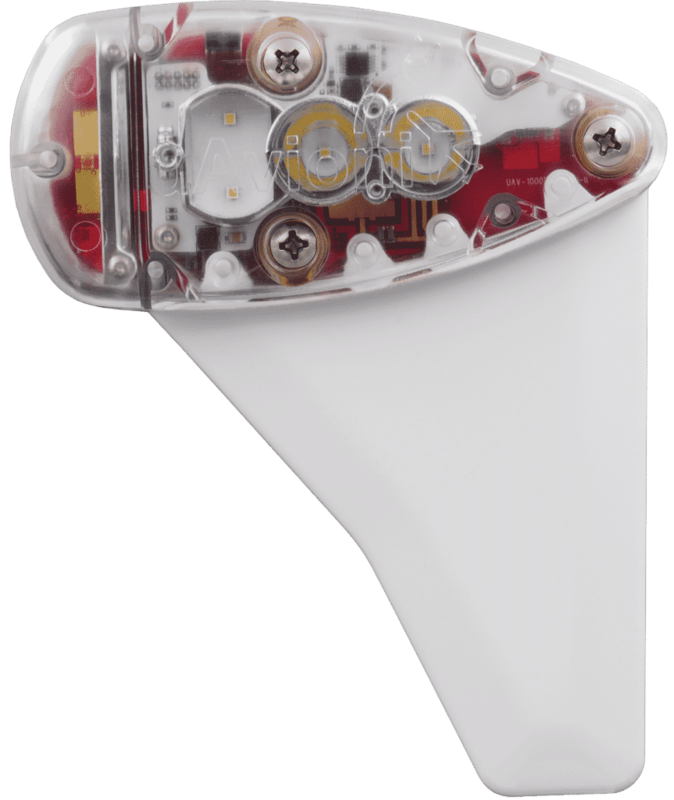 Extremely efficient LED position and anti-collision lighting complete the skyBeacon package. 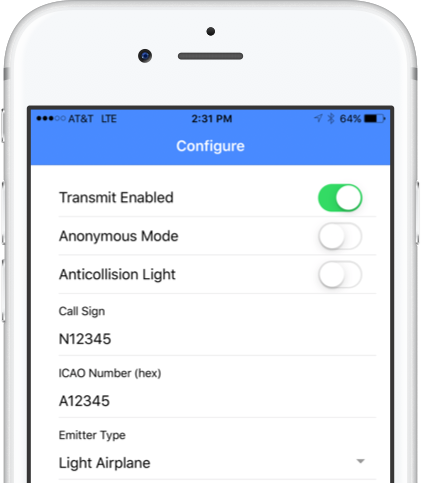 The skyBeacon mobile application allows installers to easily configure the ICAO address, emitter type, aircraft length, width and GPS offsets by accessing the aircraft registration information stored online. No cables, no serial ports, no confusing menus. 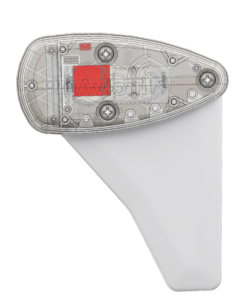 The port (left) 301 fairing is now available. Please note the following list assumes the factory wingtip configuration. The port (left) 302 fairing will begin shipping early 2019. 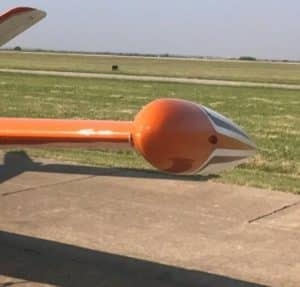 My aircraft is not on the AML, how can I install the skyBeacon? Installing the skyBeacon on an aircraft not listed on the AML is approved by the FAA. A field approval is not required. Under the FAA Memo titled “Installation Approval for ADS-B OUT Systems,” the FAA explains that after an STC is achieved for ADS-B OUT equipment, additional installations can be accomplished on aircraft not listed under the AML STC by an A&P with Inspection Authorization (IA) so long as the installation does not require airframe modification. Why doesn’t the Monitor screen in the mobile app reflect the changes I’ve made? In some cases with certain devices, the mobile data feature must be disabled to configure the skyBeacon. Some devices like the Motorola Moto lineup frequently display this behavior. We are tracking this issue and working on a resolution. Do I need the internet to configure the skyBeacon or tailBeacon? No, you do not need the internet or an internet connection while configuring the skyBeacon. The “Wi-Fi” connection is simply a radio signal that connects the skyBeacon application on your mobile device to the skyBeacon. You will see a warning of “no internet connection,” but that doesn’t matter because you are not trying to connect to the internet; you are using the Wi-Fi radio signal as a connection for the mobile app to communicate with the skyBeacon. Is skyBeacon eligible for the FAA ADS-B rebate? The certified skyBeacon is eligible for the FAA rebate. In order to select the skyBeacon you’ll need to set the data link option on the rebate form to UAT, and choose uAvionix skyBeacon TSO as the ADS-B transmitter. An example of the rebate form is shown below. 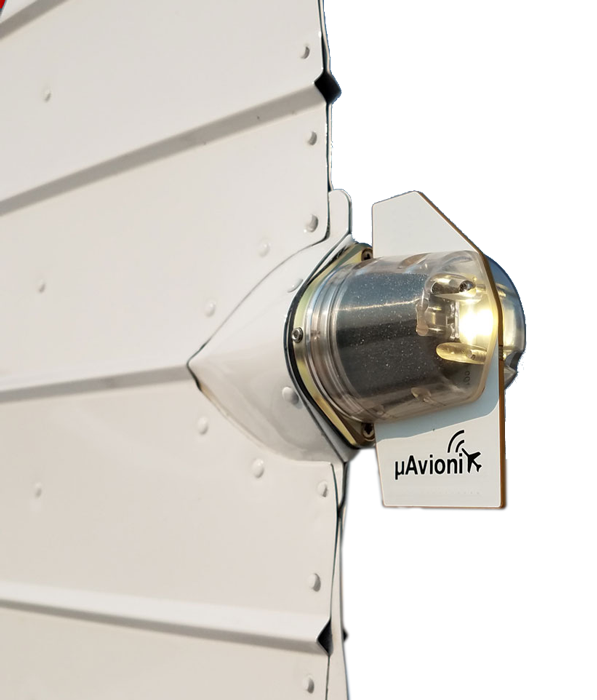 skyBeacon is designed to be a direct replacement for the common navigation light or nav/strobe found on many aircraft. 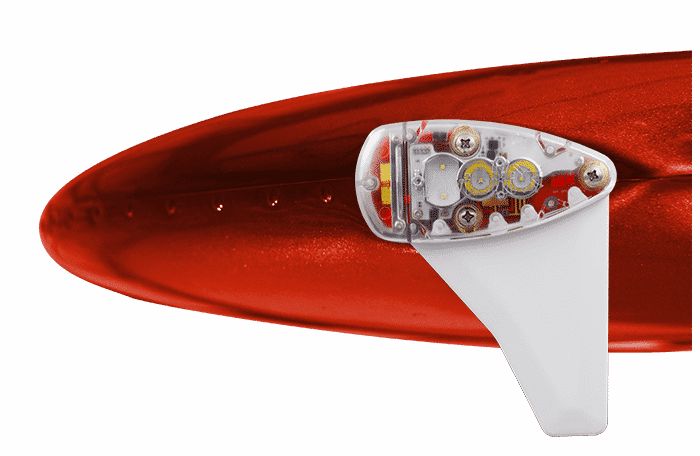 skyBeacon has the form factor and installation characteristics of a traditional Grimes style teardrop shaped wingtip navigation light. skyBeacon is a direct replacement for the lights shown below (as an example). After the outer cover screw is removed the mounting base for the lights shown above will have the same 3 hole mounting pattern as skyBeacon. See installation manual for full details. It is recommended that you download the skyBeacon installation and user instructions and carefully check the installation template with the aircraft prior to purchase ensuring that the skyBeacon will fit your aircraft. Does skyBeacon work with tip tanks? 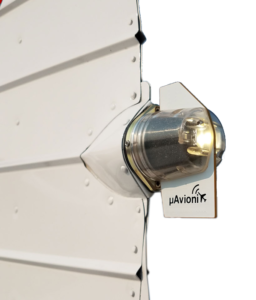 We do not currently recommend skyBeacon be installed on aircraft with fuel tanks commonly referred to as tip tanks which were popular additions to some aircraft. Tip tanks or other large obstructions on the wing may negatively impact GPS performance. 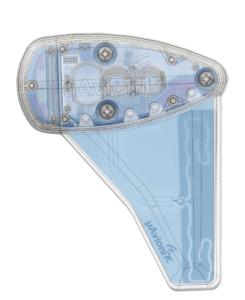 For guidance on fitment and installation submit a photo of your wingtip along with the year, manufacturer and model to support@uavionix.com. What do you mean by tip tank? 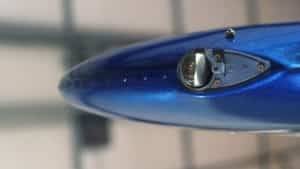 What about integral tanks in the wingtip? Wingtips with normal profiles are fine for skyBeacon. 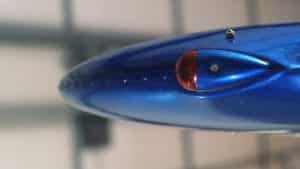 The integral tanks on most Piper aircraft are not a concern and should be compatible with skyBeacon. My wingtips don’t work with skyBeacon. What are my options? The tailBeacon ADS-B out solution is now available for Experimental aircraft. A TSO version is also planned for release. 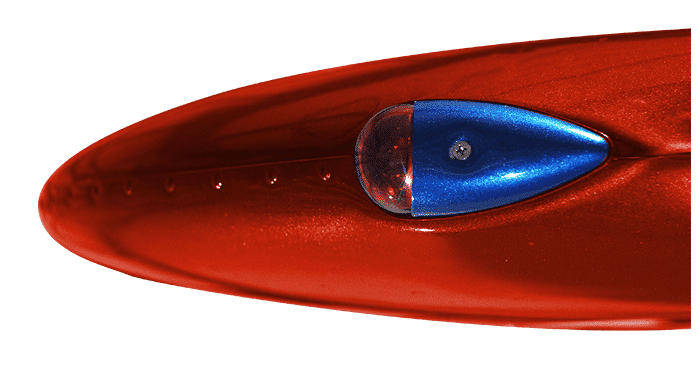 The tailBeacon is a direct replacement for the common rear position light. There are several wingtip manufacturers offering Cessna and Piper wingtips to improve performance and support new lighting configurations. In many cases, new wingtips can lower your stall speed and add tangible performance improvements. One such manufacturer is Stene Aviation. Can I install skyBeacon as the owner of the aircraft? Light Sport Aircraft: With manufacturer approval. Certified Aircraft: You cannot install skyBeacon unless you have Inspection Authority for your aircraft. We recommend you contact an avionics installation facility or your regular Inspection Authorization (IA). Most IAs, aircraft maintenance facilities, and/or repair stations are also qualified to install skyBeacon. Please note that the installation must be tested to verify proper configuration and operation. Who can install the skyBeacon? For certified aircraft, the skyBeacon must at the very least be installed by an Airframe and Powerplant mechanic (A&P) and the installation must be reviewed and approved (signed off) by an IA. Part 145 shops and facilities with avionics expertise will optimize timely installation and downtime in addition to reducing overall cost. The skyBeacon has been designed to be a simple installation. Please see the Installation Manual and Pilot’s Guide for full instructions. The installation process is to first remove the existing left-hand wingtip light. Connect the skyBeacon using the three wires as per the installation instructions and use the three screws to attach the skyBeacon to the wingtip. After the mechanical installation is completed the SkyBeacon must be configured using the SkyBeacon mobile application for Android or iOS. A typical skyBeacon installation will take an installer around 1 hour – this is the time taken for the physical installation of the skyBeacon to the aircraft and the paperwork needed to sign off the installation. Please note that all aircraft are different, especially older aircraft that have been modified for other STC’s. This can potentially affect the installation time. This is why it is extremely important to discuss the installation with a certified avionics shop or A&P or IA. How is the installation tested to ensure it meets the FAA Requirements? Once the skyBeacon has been installed it is required that the equipment be tested to show it meets the FAA requirements for ADS-B OUT. An Operational Flight Evaluation (often referred to as a performance flight) must be performed and verified by the FAA. Additionally, the installer may verify performance on the ground using an ADS-B ramp test set. Ramp Test Equipment (ref. section 91.407(c)). Use ramp test equipment (e.g. Aeroflex IFR6000) to verify proper system configuration and compliance with section 91.227 equipment performance requirements. Operational Flight Evaluation: See next FAQ titled: What does the Operational Flight Evaluation Consist Of? What does the Operational Flight Evaluation consist of? Do the aircraft position/nav lights need to remain on during all operations? Does the TCAS limitation apply to my aircraft? The only impacted aircraft are those with active (interrogating) TCAS systems. These systems provide aural resolution advisories, and will generally be marked as TSO-C119. TCAS systems are required for Part 135 operations on large turbine powered aircraft. Aircraft equipped with TIS or ADS-B In systems for traffic awareness are NOT impacted. Also not impacted are TCAS-like systems such as the Skywatch 497. ADS-B receivers providing data to a G1000, ForeFlight or other moving maps provide an additional level of situational awareness but they are NOT TCAS systems. There is no limitation on installing skyBeacon alongside these systems. How is my device protected from theft? 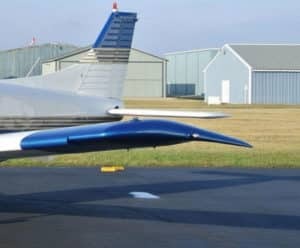 The certified skyBeacon and tailBeacon feature a unique password secured configuration interface via Wi-Fi. A user must enter the password to change the device configuration including the aircraft ICAO and callsign. The password is unique to the device, and once configured, cannot be reconfigured for another aircraft without that password. The password is essentially an anti-theft key, and should be kept secure with aircraft record. There are no external markings or indications on the skyBeacon or tailBeacon to indicate the password. uAvionix will be able to provide the password if lost provided proof of purchase can be validated. My questions have not been answered, where do I go for support? We suggest you read the TSO manual located here. If you still have questions please send an e-mail to support@uavionix.com and we’d be glad to help. Will skyBeacon meet the U.S. ADS-B 2020 mandate? Yes, skyBeacon will meet the 2020 ADS-B requirements when paired with an operational Mode C or Mode S transponder. skyBeacon meets or exceeds all required performance and environmental standards for use in the national airspace. The certified skyBeacon will ship with 5 separate TSO certifications. Will skyBeacon work outside the U.S.? No, skyBeacon transmits on UAT (978MHz). The UAT (978MHz) frequency is only approved for use in the United States below FL180 (18,000′). For international travel or flight above FL180, a 1090ES transponder is required. Will there be a version with strobes? All skyBeacon products now ship with an LED strobe. Note: Early experimental versions of skyBeacon did not have the strobe installed. What about a matching version for the starboard (right) wing? We’ve felt it most important to focus on the products that help you meet your mandate deadline, and we will be following up with starboard side options. 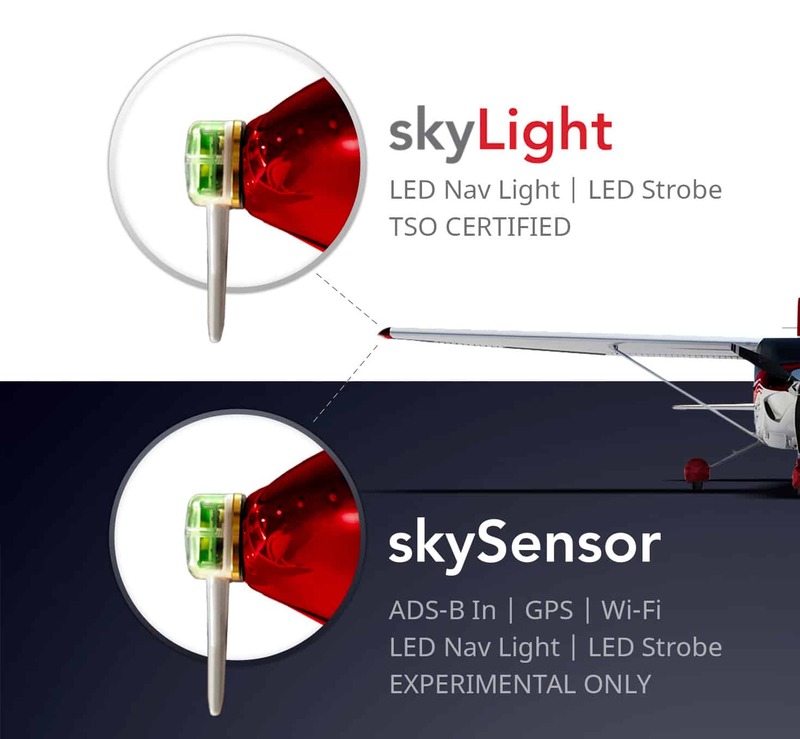 For the experimental/LSA aircraft owners – we already offer skySensor – a starboard side ADS-B IN receiver and position/strobe light. Currently, these are available online and through our resellers. We will not be certifying skySensor, but we will be producing a certified starboard side matching light called skyLight in Q1. We will be offering bundle pricing but will extend the discount to customers who have already purchased skyBeacon. Reserve your rebate, get skyBeacon installed – don’t wait for skyLight – we’ll get it taken care of for you. Will there be a version with aft (rear) position lights? At this time there is not a wingtip mounted version with integrated rear position lights in development. 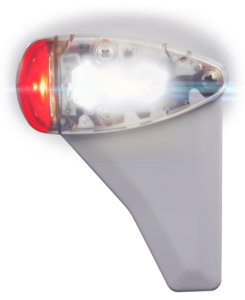 There is a replacement rear position light without strobe in development under the working name tailBeacon. Don’t see the answer to your question? Feel free to contact us.